This is a Master of the Ceremonies book for Brighton, bound with red leather. 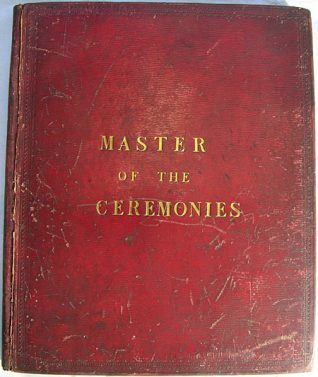 Printed at the top of each page is, 'Master of the Ceremonies.'. The first page is dated 1 January 1821 and the first entrant in the book is 'His Majesty the King' (the King being, King George IV). The book was made in the early 19th century by 'Elvey, Stationer', in Holborn, London. An important figure at fashionable health resorts and spas in the eighteenth and nineteenth centuries was the Master of Ceremonies. He regulated and organised events, maintained registers of visitors in the libraries, and effected introductions. Brighton had three Masters of Ceremonies in its early years as a resort. a) CAPTAIN WILLIAM WADE: Appointed in about 1767, Wade also officiated at Bath until 1777 when he was forced to leave for publicly ridiculing an admirer. He regulated the principal assemblies at the Castle and Old Ship , and promulgated rules within the town, even, in 1787, prohibiting the playing of games on the Steine on penalty of a fine. By 1806 though, his influence was waning and he was attending functions at the Castle Inn only following a dispute with the Old Ship . Wade’s last season was 1807, and he probably died the following year. b) WILLIAM FORTH: Chosen by a committee in 1808, William Forth proved to be unpopular, and the Old Ship even appointed its own master of ceremonies until 1819; he also had a series of disputes with the Castle. On 25 November 1823 Forth became the first toll-paying visitor to the Chain Pier , but ill health and increasing unpopularity led to his resignation in March 1828 from a job which at that time paid over £1,000 per annum, a very considerable sum. c) LIEUTENANT-COLONEL JOHN ELD: The third and last Master of Ceremonies was elected at a meeting of prominent inhabitants at the Old Ship in 1828. Eld attended balls and made introductions as usual, but with the advent of the railway from London in 1841 his functions largely died out as many times more visitors arrived by train than ever did by coach. The Master’s Ball continued until 1854 though, and Russian officers from Lewes Gaol (at the time of the Crimean War) were invited to the last one. Eld died on 22 December 1855 at the age of 76, and the office was then discontinued.